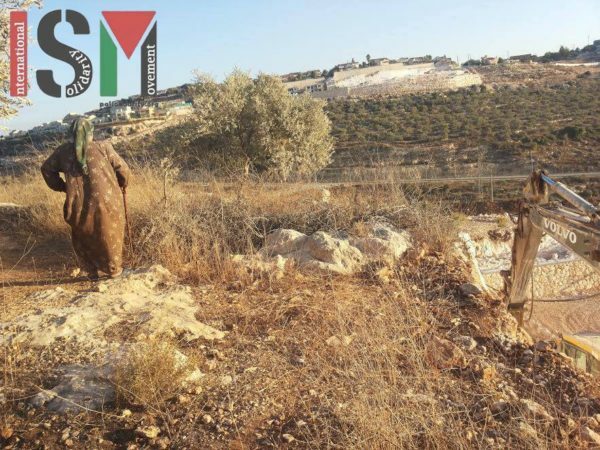 For the past six days, international activists joined a Palestinian farmer, Fares Deek, in the harvest of his olives outside Kafr ad Dik village, located inside Salfit governate. 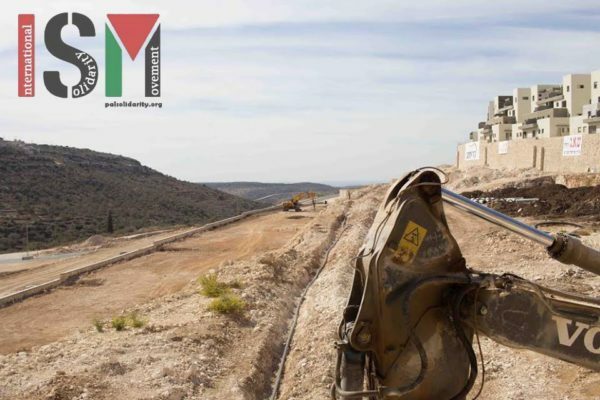 For the past 16 years, the area has been a target of expanding illegal Israeli settlements. Fares field is today surrounded at the north, east and west sides by Lashem settlement, started in 2010, with 700 units inhabited and another large number under construction. “They surrounded all my land and cut my road coming to my land. When they finish, I think I cannot come to my land.” Fares explained about the situation he is living in. 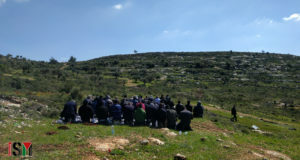 Fares reported that until now, Israelies, have stolen 700 dunums to build Lashem, leaving seven families that own fields in the same hill, without their land, only to establish this illegal settlement. Eight months ago, bulldozers destroyed the agriculture road that used to lead up to Fares field. Lashem has also cut him off the road to another field he owns, now on the north of Lashem illegal colony. It used to take Fares 5 minutes to drive from Kafr ad Dik to the land, but to reach it now he has to cross a valley, after driving through Der Ballut and Rafat villages, then he needs to climb for half an hour to the top of the mountain where the field is. The last time he visited that field for the harvest was in 2013. The time and the money needed makes it hardly worth the out-put anymore. Two other settlements, Pedu’el to the south and Ale Zahav, behind Lashem, to the east complete to enclose his field. 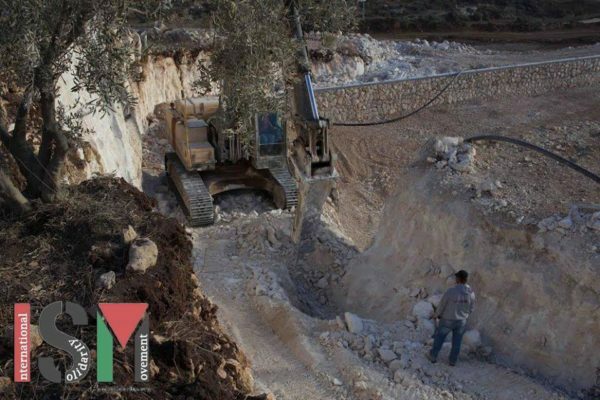 Just like Lashem, the illegal colony of Pedu’el, is also being expanded. 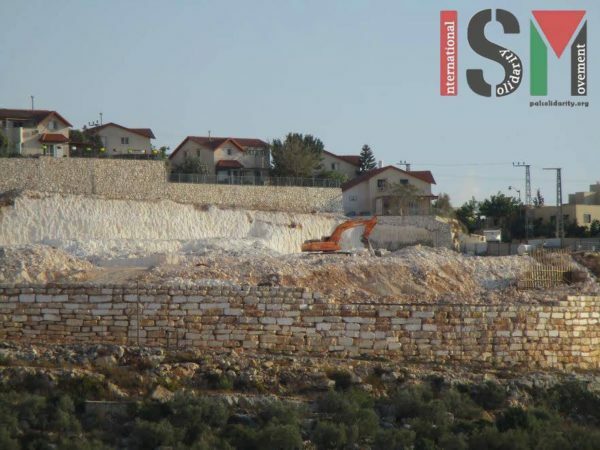 Also to the north of Kafr ad Dik, the village Fares lives in, the new illegal settlement of “Sahar” is being formed on top of the mountain that Palestinians know as, Daher Subeh. The area is being advertised as a quiet, peaceful place for Israelis to move to, according to Fares Deek. “Israeli wants to encourage people to live here. As living cost is less, all the water you want is available, good for factories and no taxes! During the first day of the harvest, many settler colonists showed up at Fares field. Some of the colonists where openly carrying firearms and monitored the family while picking their olives. “I have a bad feel about zionism. About anyone who came to take your land, to take your freedom, and take your hope. How would anyone in the world feel if he had to go through all this? There is a well in Fares land that he used to use for drinking water, but 6 years ago after settlerers started to throw down big rocks and to take baths inside it, he couldn’t use it any more. Dust is being spread from the bulldozers working on Lashem, causing damages for the olive trees. Bulldozer working at the edge of Farres land at the place where they cut his agricultural road. 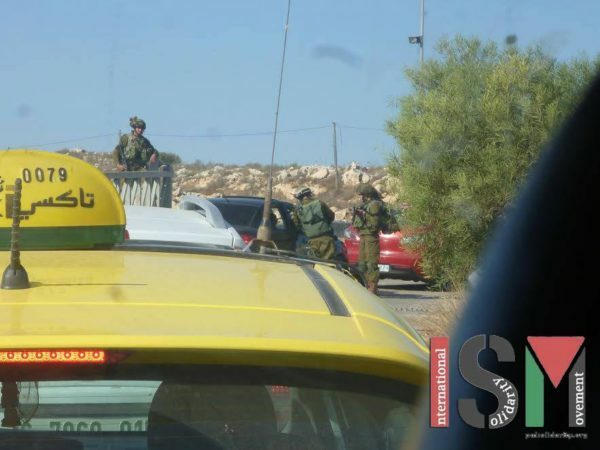 As we drove with the family towards the field the second morning harvesting, the Israeli army had put up a check-point at a metal road gate in the exit of Kafr ad Dik. The team was stopped for a total of 28 minutes by the four soldiers that were operating this checkpoint. Even though Fares said that he was going to pick his olives, the soldiers demanded to check IDs and kept asking questions. When we finally got told to leave, Fares said that this was a common occurrence. This road gate was closed for 5 years between 2000 and 2005, forcing the people of Kafr al Dik to take an alternative route in order to exit the village, Fares explained. Fares also reported that he has frequent visits from the Israeli forces while working in his field. He explained that there is a military tower in Pedu’el and sometimes the army will arrive very quickly after he enters the field. Also he thinks that Lashem will be finished in one to two years and that he is not sure if he will be able to harvest the olives next year.